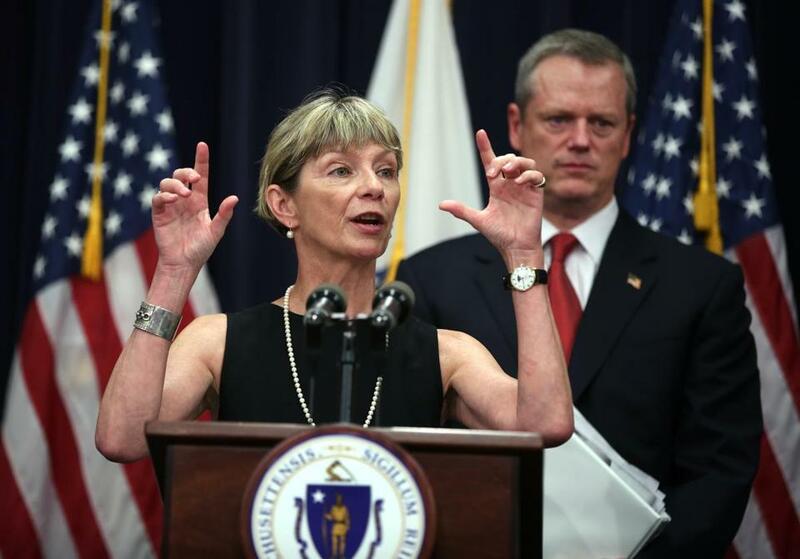 Marylou Sudders, the state’s secretary of health and human services, and Governor Charlie Baker addressed the task force’s findings in June 2015. Facing a deadly surge of opioid deaths — about 1,500 last year — and thousands more overdoses, Governor Charlie Baker and the Legislature have expanded funding for treatment beds. They’ve mandated new verbal drug risk screenings for schoolchildren. And the policy makers have limited initial opioid prescriptions, in an effort to stanch the supply of the addictive drugs. But one year after his administration’s task force released 65 recommendations for addressing the crisis — and began implementing most of them — Baker and his health and human services secretary, Marylou Sudders, said long-term challenges remain. In a rare joint interview, they described the persistent difficulties of bringing about a cultural shift to further reduce the stigma of addiction. The two officials also emphasized the sweep of the scourge and the length of the journey ahead even though the state is headed in the right direction. They said the big-picture metrics for measuring success include: fewer opioids prescribed in Massachusetts, fewer overdoses, fewer deaths, and deeper understanding among doctors and patients about the addictive dangers of the drugs. Baker said he sees prescriber education and restrictions — such as the newly enshrined limit on many initial opioid prescriptions to a seven-day supply — as key to changing the trend of opioid misuse. “I think we have to be incredibly vigilant and aggressive about working with our colleagues in the health care world on this if we expect to have any long-term success at all,” Baker said. Preliminary data for the first three months of 2016 suggest that the overdose death rate is holding steady, officials say. And Baker, a Republican who is expected to run for reelection in 2018, said the issue will have the administration’s “full attention” for years to come. “We’re all in,” Sudders said. Over the course of 30 minutes, the two top officials noted several initiatives that will begin in the weeks, months, and years ahead, from new treatment beds becoming available this summer to new requirements for doctors. ■ A revamped prescription monitoring program under which, starting in October, doctors and dentists will be mandated to check before giving out an opioid prescription. That’s to help screen for people doctor-shopping, going from physician to physician looking for opioid drugs, such as OxyContin, Percocet, and Vicodin. ■ An anticipated expansion of Medicaid — the state-federal health program for the poor and disabled — so people struggling with addiction can receive up to 30, instead of 15, days of residential treatment. ■ And a requirement, starting in the 2017-2018 school year, that all public school districts in Massachusetts verbally screen students in two grades (yet to be determined) for potential drug use, with an eye toward preventing opioid abuse at an early stage. Sudders also spoke repeatedly about using newly compiled data, such as where, exactly, high numbers of opioid overdose deaths take place, “to hot spot” and target state resources, such as money for new treatment facilities. The officials also addressed concerns from people suffering from chronic pain who worry they are losing access to critical drugs. They emphasized that the new limit on initial opioid prescriptions doesn’t apply to people with chronic pain. Several observers praised Baker’s efforts. Other experts praised Baker for his efforts. And the president of the Massachusetts Medical Society, which earlier clashed with Baker over his proposed limits on opioid prescriptions, offered a warm statement praising the state’s chief executive.